Date: Saturday, March 2, and Saturday, March 30, 2019 ** THIS WORKSHOP IS NOW FULL. Time: 1:00 p.m. – 4:00 p.m. on the 2nd/3rd. 1:00 p.m. – 2:00 p.m. on the 30th/31st. Level of Skill Needed to Attend: None to a little experience working with clay. 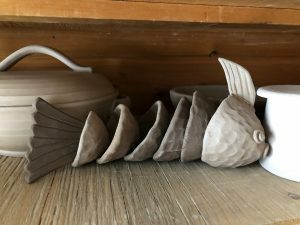 In this two part workshop, you will make a fish shaped wind chime using the pinch pot method. Part 1: In the time allotted (3 hours) you will be making 5-6 pinch pots in descending size, that will become the body and head of the fish. You can decorate the pots with stamps or textures, and add eyes and a fin to the head if desired. You will also need 10 – 12 clay beads to place between each pinch pot or section of the fish, so that when you string the fish up, the beads keep the pots in place. Then, using a small slab of clay, you will form a tail that will become the sail of the wind chime. You will choose up to 3 colours of glaze for your wind chime and due to size constraints in the studio, the bisque firing and glazing will be done by your instructor. In Part 2 you will return to the pottery to string your Fishy Wind Chime together and attach the sail, which should take about an hour or so. All materials for your wind chime project are included in the fee. Signing up: Please send an email to LM@LMSerafin.com with your contact info, which includes your full name, address and telephone number(s). Please name the workshop in the subject line. Upon receipt of your email, Lisa-Marie will send you instructions on how to pay for the workshop. Cost: $75.00. All materials and firing fees included. Can be paid by Interac eTransfer (preferred) or PayPal (add 5%). Fees MUST be paid in advance of workshop. Once you are signed up there are no refunds unless your spot can be filled in the workshop. Inquire with Lisa-Marie in the event this should happen. Dates of workshop: You MUST be available for BOTH Saturday, March 2, and Saturday, March 30, 2019. Time: 1:00 p.m. – 4:00 p.m. on the 9th. 1:00 p.m. – 3:00 p.m. on the 23rd. Cost: $85 which includes ALL materials, glazes and firing of the project. In this two-part workshop you will get a chance to try your hand at the Potter’s Wheel and learn the basics as well as get a chance to glaze your own piece(s). How to properly wedge your clay to prepare it for throwing on the wheel. How to center the clay, cone up and why it is done. How to open the clay and make a cylinder and a bowl form on the wheel. How to trim a foot ring for a beautiful finish. After your piece has been made and trimmed by you, it will dry and then it will be bisque fired by your instructor. You will be returning to the pottery to glaze it (see dates below). At this pottery, we dip and pour glazes, but there are options to work with oxide washes or a secondary glaze if you have the notion to wield a paint brush. Multiple colours can be used when dipping or pouring as well. After glazing, the pieces will be fired and then they will be ready to be picked up about a week or two later. Cost: $85.00. All materials and firing fees included. Can be paid by Interac eTransfer (preferred) or PayPal (add 5%). Fees MUST be paid in advance of workshop. Once you are signed up there are no refunds unless your spot can be filled in the workshop. Inquire with Lisa-Marie in the event this should happen. Dates of workshop: You MUST be available for BOTH Saturday, March 9, and Saturday, March 23, 2019.